If you're in the market for something to do with those spare egg whites, I have an idea for you. Now that stone fruit is in abundance, it's just about time to celebrate our bounty with an almond dacquoise. Dacquoise is a meringue that contains toasted nuts. It's another versatile pastry component for your repertoire that is very simple to make. It's classically used as a layer in cake construction along with buttercream. I was first introduced to it in pastry school in the form of Gateau Marjolaine, a complex French cake created by Chef Fernand Point and made of layers of dacquoise, hazelnut and almond praline buttercreams and finished with chocolate ganache. A very big project. For something much easier and not so rich, I like to layer dacquoise with a billow of whipped cream and fruit or serve with ice cream and a drizzle of chocolate. The toasted nuts provide depth of flavor and texture to the sweet crunchy chewy meringue. The method for this dessert is simple. Just whip the egg whites with sugar to stiff peak and fold in the almonds, which have been ground with sugar and a touch of cornstarch. Bake the disc until it's nicely browned, then compose the dessert with cream and fruit. You get a nice crispy/creamy dessert with a good dose of freshness and acidity from the nectarines. This almond dacquoise would be good with just about any spring/summer fruit: apricots, plums, peaches, cherries, raspberries or figs. Or pair it with vanilla, caramel or coffee ice cream and garnish with a dark chocolate sauce. So keep this dessert in mind the next time you have some egg whites waiting on your refrigerator shelf looking for something fun to do. - To toast the almonds, place them in a single layer on a baking sheet in a 350 degree oven for about 10 minutes. Cool. - Raw egg whites can be stored in an airtight container in your refrigerator up to four days. Each egg white is 1 ounce, so weigh out 3 ounces for this recipe if you have a stash in your refrigerator. - Egg whites will whip with greater volume if they are at room temperature. Begin the process by whisking the whites with a pinch of salt until they are foamy and opaque. For a stable meringue, slowly add the sugar and then keep whipping until they are glossy and form a stiff peak. You test this by lifting your whisk with a dollop of meringue. It should hold its peak without slumping over. If the meringue starts to look dry and grainy and begins to separate, you've gone too far. - Use brown sugar instead of granulated in the dacquoise for a richer, caramel taste. - Substitute walnuts or hazelnuts for the almonds for a different flavor profile. - For a Coffee Almond Dacquoise, add 1/2 t instant espresso powder to the dry ingredients. 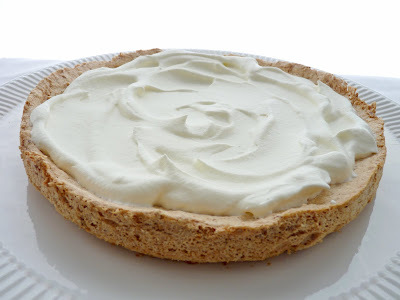 - As an alternative, add a dash of cinnamon or a splash of rum to the whipped cream. - I baked my dacquoise in a springform pan for a more finished presentation but you can simply spread the meringue on a parchment lined baking sheet in whatever shape you wish. Individual meringues are nice, too. Preheat oven to 300 degrees. Line bottom of a 9" springform pan with a round of parchment. Place the almonds, 1/4 cup sugar and cornstarch in a food processor and process until most of the almonds are finely ground with a few larger pieces. Whip egg whites with a pinch of salt until foamy and opaque. Slow add the remaining 1/4 cup sugar and beat until the meringue is stiff, glossy and holds a firm peak. Fold the dry ingredients into the meringue. Pour into the prepared pan, spread out to the edges and smooth the surface. Bake for 35 - 45 minutes until dry and golden brown. Place on a wire rack and cool. Release the springform ring and gently remove the dacquoise from the parchment paper. Place on a serving platter and set aside. Cut nectarines in half and remove the pit. Cut into thin slices and toss with brown sugar and lemon juice. Set aside to macerate for about 20 minutes, stirring once or twice to distribute the juices and coat the fruit. Whip the heavy cream with the sugar and vanilla to soft peak. Spread evenly on top of the almond dacquoise. 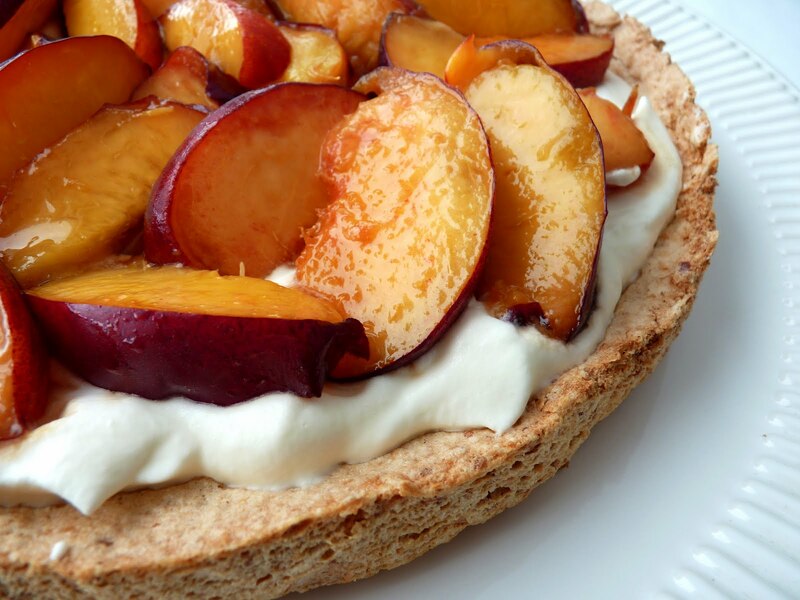 Layer the nectarines on top of the cream. Serve with a spoonful of the fruit juices. I won't pitch my normal stone fruit fit of jealously because this looks like it would be positively scrumptious with all kinds of fruit. Two weeks ago I picked blackberries in Jackson, Georgia, on my friend's farm, and they were d___ delicious made into a cobbler. But swirled with a little sugar and used in place of those nectarines, they would have been ethereal. Next time. this looks so good..and sounds really easy to make. after a recent ice cream kick, this will be perfect for all the whites. the addition of nuts makes the thought of eating this more interesting, more substantial, than just a plain meringue. always wanted to attempt dacquoise to see how to work with it. maybe in layers? and yah, seems like a natural with stone fruit now. Howdy, Food Hunter! Yes, easy peasy! OMG, Victoria, fresh picked Georgia blackberries in a cobbler sounds like HEAVEN. Berries would be great with this dacquoise. Hellooooo, Bryan! Yesssss, sir, I know what you mean about the ice cream jag and having lots of leftover egg whites. I'm not crazy wild about meringue but adding nuts really changes the whole thing. And cocoa meringue is another story because it foils the sweetness. Beautiful and elegant without being too involved for me to try! Never heard of Dacquoise... but can't wait to taste it. Your site is always a great visit! The blackberry cobbler was HEAVEN, especially since we made David Rosengarten's Peach Ice Cream to go with it. Thank you, Kate. I hope you find this dessert simple and delicious. Victoria, all I can say is, WOW. Blackberry Cobbler and Peach Ice Cream would be to do for. You are one very lucky traveller!! this sounds amazing, it looks fabulous and your instruction make it sound 'do-able'. i shall bookmark this for when summer rolls around in hobart and stonefruits are once again ripe and juicy (they grow well in our cooler climate here). thank you for such a wonderful idea. Hello, e, and welcome. I have many readers in Australia but don't seem to remember your seasons are quite different. This is a very easy dessert and I hope you get to enjoy it with your favorite fruit when you have the chance. Looks delicious. Do you toast the almonds whole, unblanched? Thank you, Chris. Yes I toast whole, unblanched. Finally made this as two 6" rounds layered with vanilla-noyaux cream (fruit on the top layer) for a special occasion. Honestly, the fruit was the superstar. The nectarines are so delicious as-is, I reduced the sugar ever so slightly. 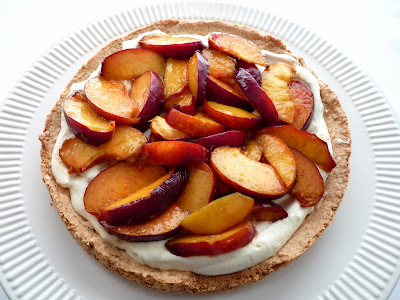 Yes, now is the time to make this with beautiful nectarines. Wow, I bet it was really phenomenal with noyaux cream and quite beautiful. Lucky guests! a drop by to say my second dacquoise is in the oven. Gluten intolerant dinner guests tonight and I knew immediately what to make. The first go round was with nectarines and followed recipe exactly. 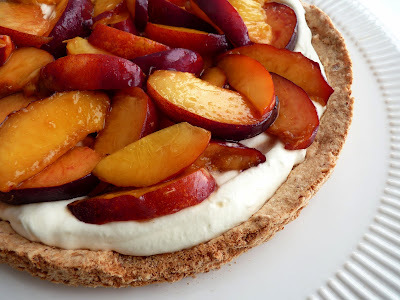 Venturing out a bit; cut sugar a tad in the meringue and am going with a mild honey and peaches with the whipped cream. Kate, thanks so much for dropping by. How cool to have a gluten-free dessert ready to make for your guests. It's an easy one to produce and just different enough for people to really enjoy. Honey and peaches with this is PERFECT. Enjoy!